Disclosure: This is a sponsored post in partnership with A Girls Guide to Cars, and Car-Ed. I was tasked (okay, honored) to a full day of driving the 2019 Mercedes-AMG E53 Cabriolet from Palm Springs to Los Angeles, where I spent another night and morning scouting locations, shooting, and filming. 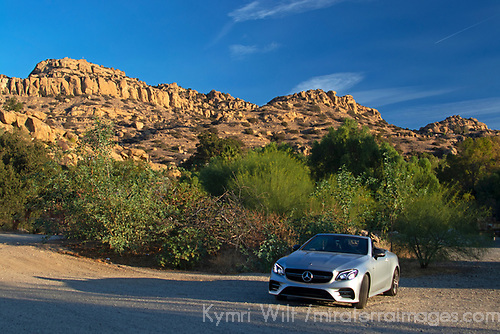 There will be a full gallery and video coming soon - this post will be updated with more about my drive experience. For now, I want to introduce you to Car-Ed. 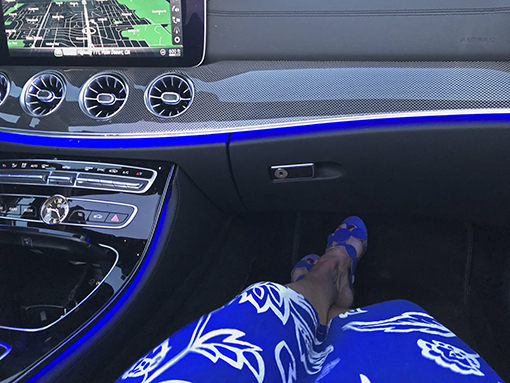 YES, I drove a 2019 Mercedes and YES, she became my new best friend ever on 4 wheels. But who knew we'd hit it off so well? Car-Ed knew. Full credit (or blame, if you ask my husband) goes to Car-Ed. Thanks to them, I've been inspired to test drive some dream cars, and to give some serious thought to brands I hadn't considered before. 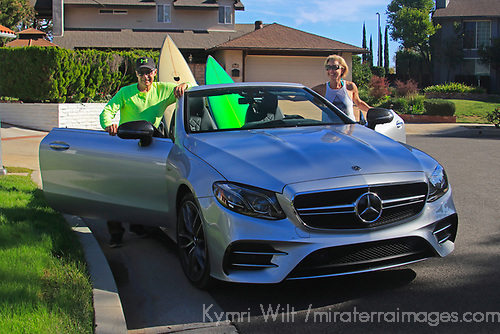 While I'm not in the market for a new car, I was glad to learn that when my family and I are ready, Car-Ed is a great starting point. 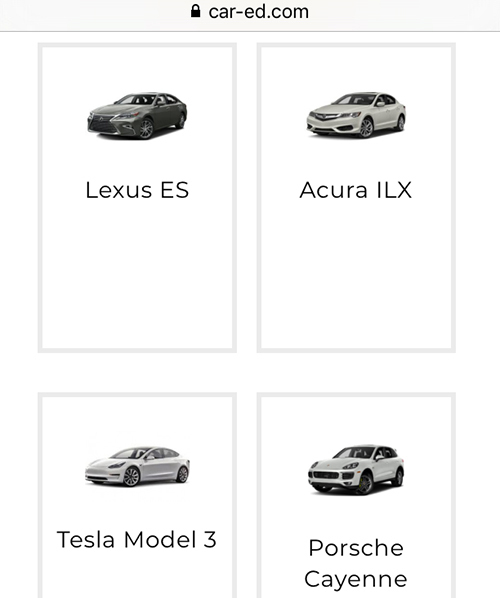 Car-Ed is an online resource to help consumers discover what cars might best match their everyday routines, behaviors, and needs. 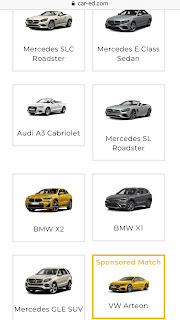 Searching online brand websites almost always demands that you enter your personal information - so your local dealer can pester you follow up. Walking on to a new car dealership lot, you meet a total stranger who tries to convince you why you might need a particular model. This is both intimidating and a waste of time. 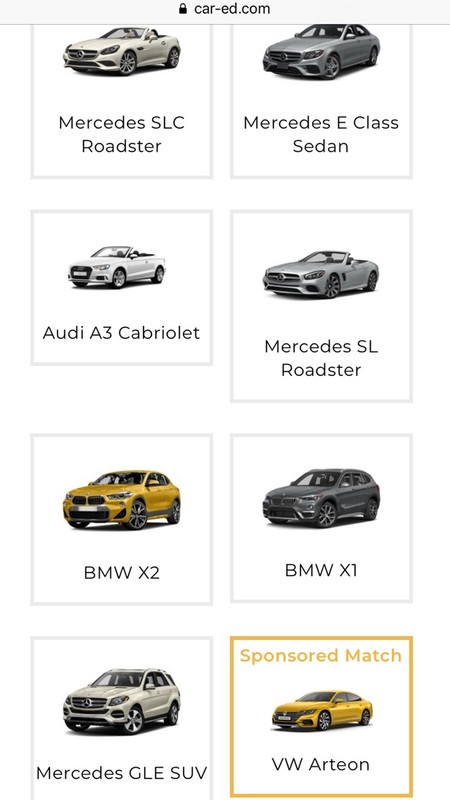 With Car-Ed, you can quickly and easily narrow down your search and save valuable time. Can you answer 12 Questions? If you say yes, that's one down. 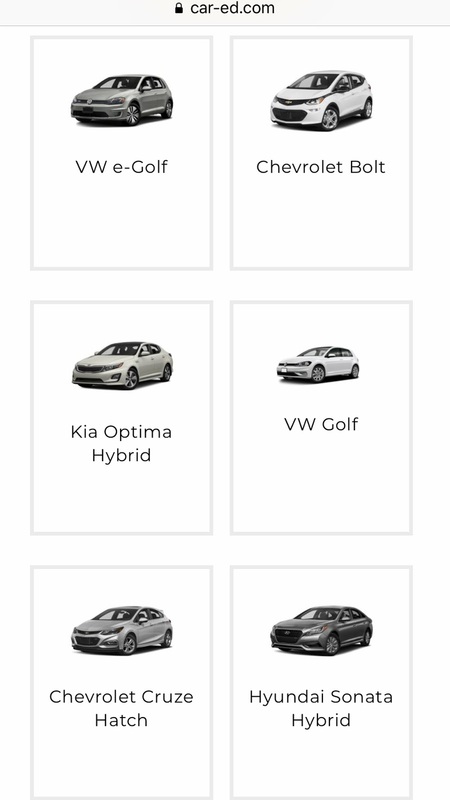 Now just 11 questions remain between you and your best matches for your next set of wheels. Go ahead, take the quiz. I'll wait. Would my Family's Results Match? I have a pretty good idea of what cars I would want to test drive. But my husband? His approach is to look for the deals, then think about test-driving the car. We do manage to meet somewhere in the middle about every 10 years. Now, we have a newly-licensed 16-year-old daughter. She will be ready for a new car within a couple of years, and has already eyed a few. 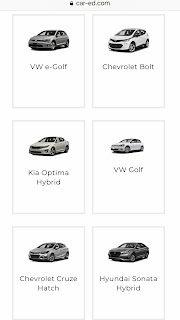 I got to wondering if we might all find some middle ground before shopping for our next car. So I sent them both to Car-Ed to take the quiz, and asked them to screenshot and send me their top results. I did the same for myself. 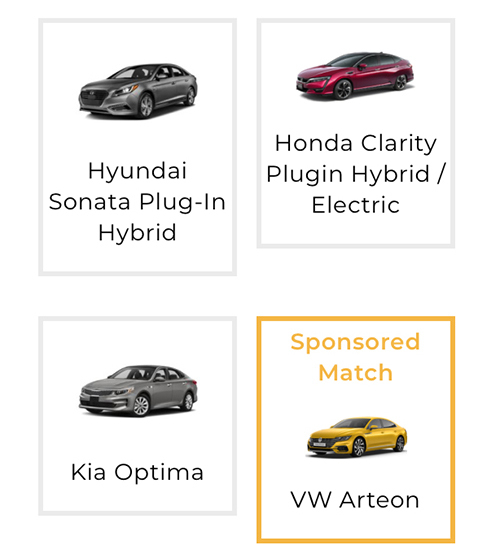 Here are our best matches according to Car-Ed. 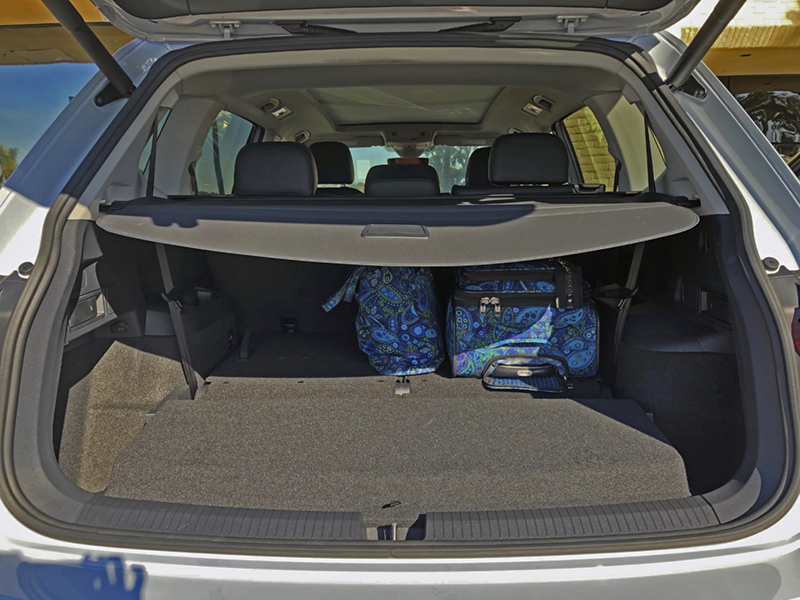 What I drive: 2016 Prius 4 (Premium/Touring), sometimes 2002 VW Passat (Turbo) wagon. I found my top choices to be pretty close. 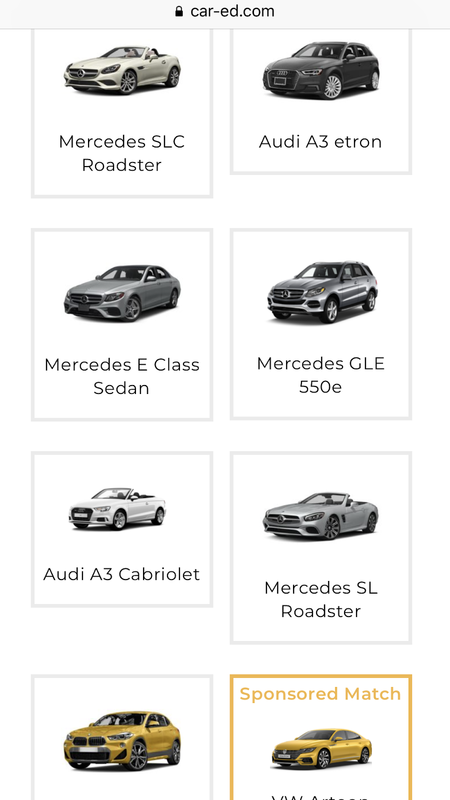 I wasn't at all surprised that luxury class vehicles made a strong showing, and popped up first. 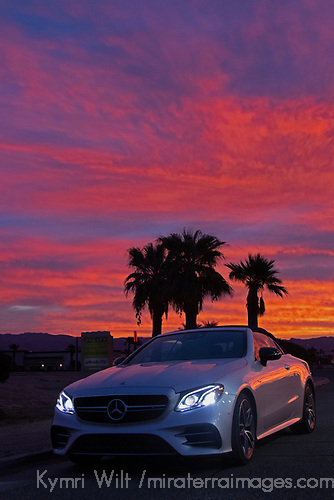 A few Mercedes Benz in the mix. I had to scroll down to find the more mainstream matches. 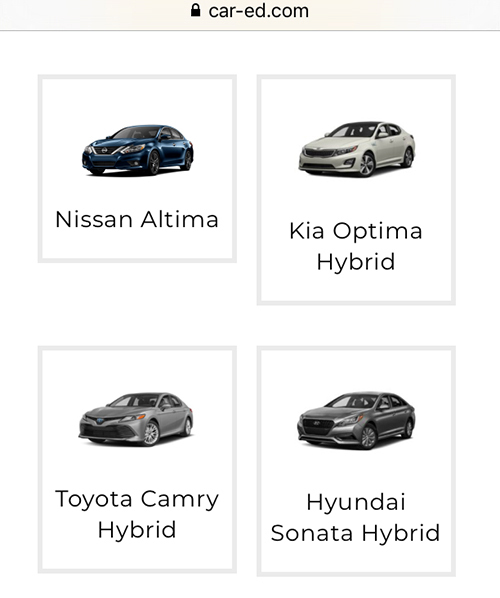 No surprise, most were hybrid, electric, or highly fuel-efficient. I drive a Prius, but not a single Prius showed up in my top results, so they missed the mark on that. What she drives: 2006 Prius, sometimes 2002 VW Passat (Turbo) wagon. My daughter sent her results first, by text. 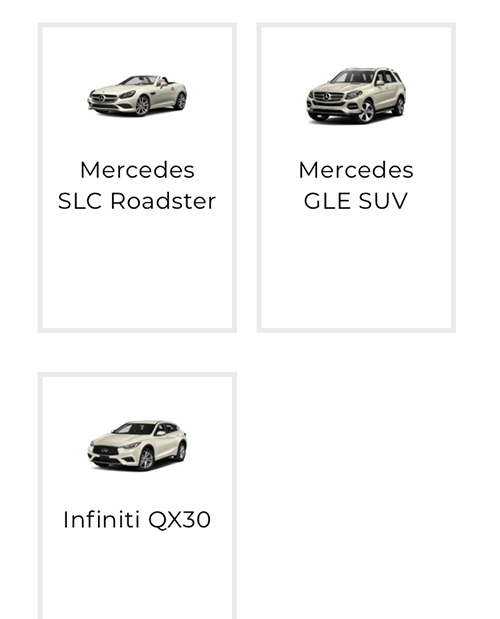 Also, strong showing for luxury, with a few Mercedes Benz in the mix. Her text message read: "These were my top matches. The cars it gave me are really ugly. I only like the Audi." Oh such a picky teen! She drives an unpretentious older Prius, by choice, and no Prius showed up in her mainstream results either. What he drives: a bike; sometimes the 2006 Prius. Here came the real test, my husband's results. Let it be known, this is the guy who refuses to upgrade from the perfectly functional iphone 4 (thus the tiny screen shots). He commutes by bike to/from work, and isn't a big fan of freeway driving and traffic. 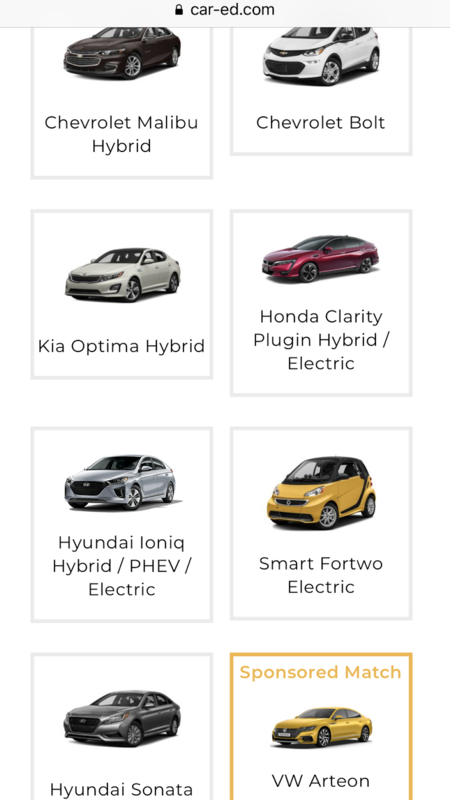 Predictably, his first screens showed almost all hybrid and electric mainstream options. Then, below the fold, the luxury brands, including Mercedes Benz. 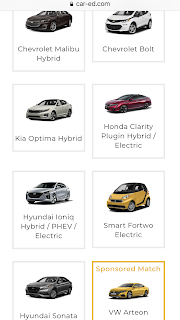 So in his case, the environmentally-friendly options were spot on, but still, no Prius in the top matches. 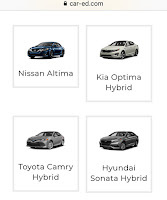 So the most glaring common thread for all of us is that we need to look beyond our Prius-vision realm. 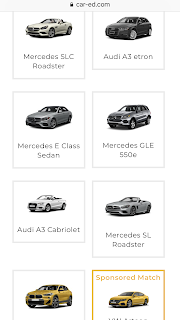 And clearly, we need to consider more Mercedes Benz models! Top down on a beautiful sunny Los Angeles day! Loading the boards is easy with the top down. Ready to hit the waves with my brother! 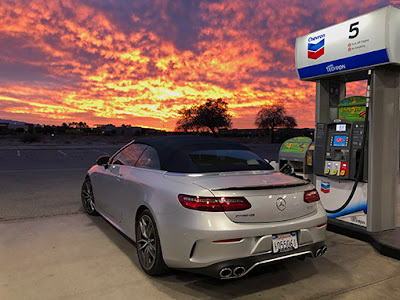 Watch for this post to be updated soon, with a video edit from the full 48 hours of driving and shooting the Mercedes Benz E53 Cabriolet! Looking good in every light! 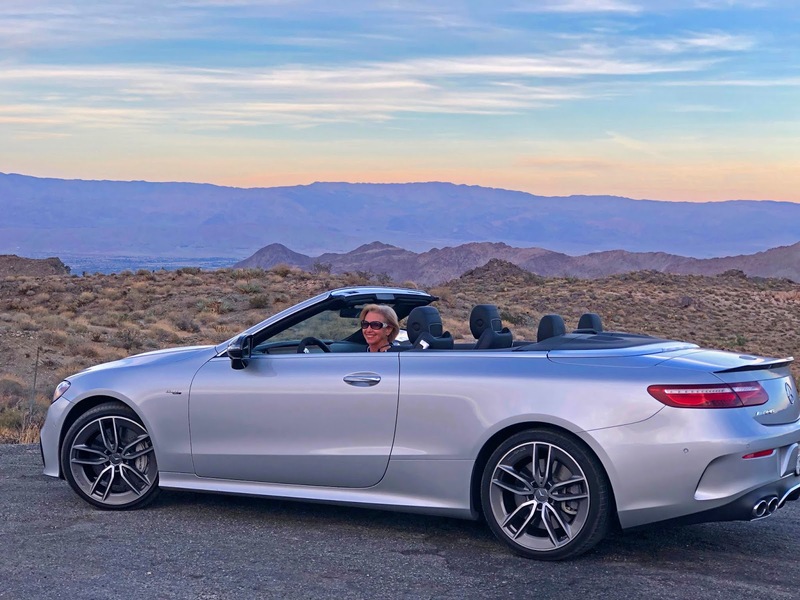 Disclosure: This is a sponsored post in partnership with A Girls Guide to Cars, Visit Greater Palm Springs, the BMW Performance Center West, and Miramonte Resort & Spa. While most of my experience was hosted, my opinion is my own. Why do I need a getaway? 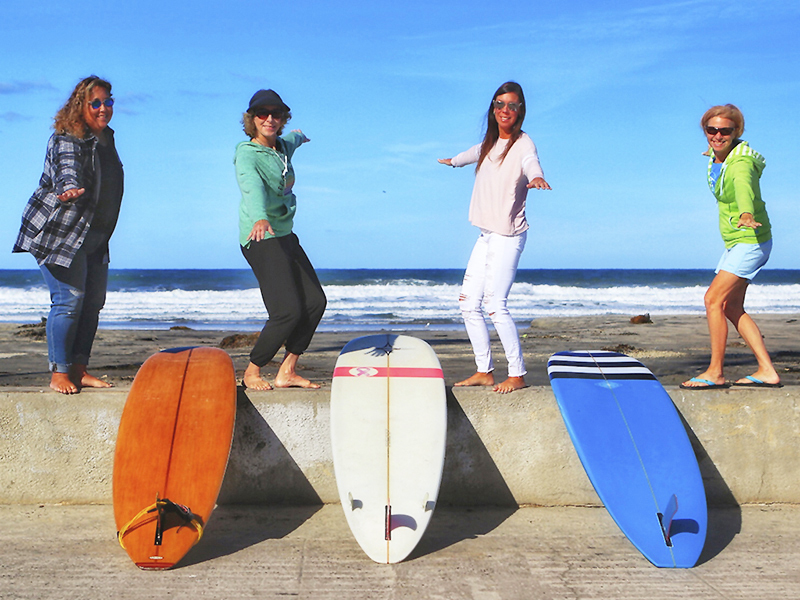 I know what you’re thinking - why would someone who already lives in the “paradise” that is San Diego need a getaway? Well, let’s face it, even San Diego can get cold and dreary this time of year. The ocean temperatures drop, and the winds whip up the waves as storms roll in from the Pacific. The rains bring the freeways to a crawl, and flooding to the streets. Nothing sounds more appealing than a short getaway to somewhere warm, dry, and relaxing! If you’re dreaming of such a getaway, be sure to enter the Giveaway posted at the end! 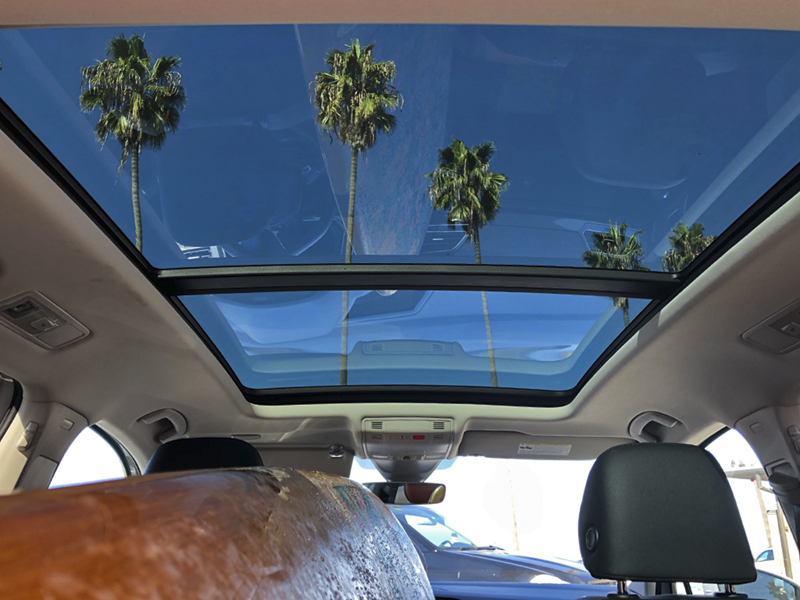 A Palm Springs getaway from San Diego begins with the drive. While there’s always the option to take the freeway the whole way, it’s not always the fastest, and it’s certainly not the most interesting. Instead, weather conditions permitting, exit the 15 in Temecula, and head east on 371, through rural farmlands and vineyards. You’ll run right into scenic Highway 74, aptly named the “Pines to Palms Highway,” which will take you up in elevation through the Santa Rosa Mountains. 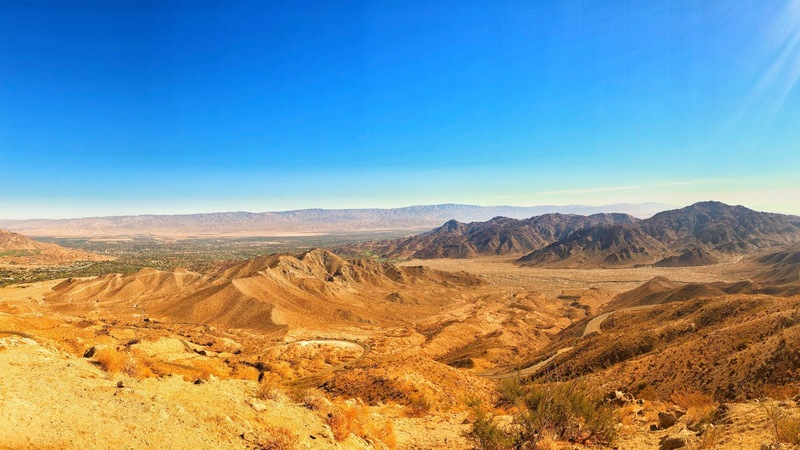 As you descend down the switchbacks into the Palm Springs Valley, watch for the scenic overlooks - they are not to be overlooked! 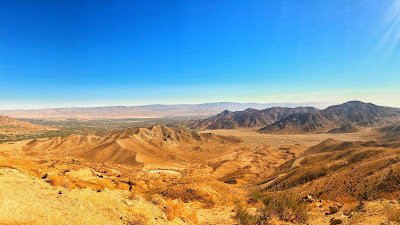 Mid-day view from Vista Point, where road winds down into Palm Springs. 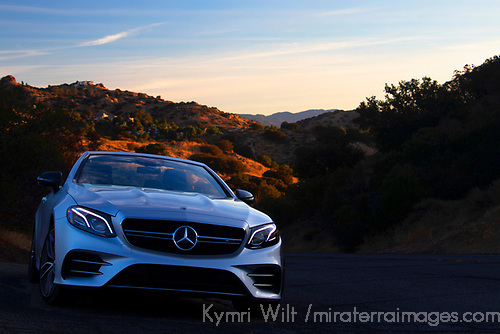 Photo by Kymri Wilt. Behind the wheel at the BMW Performance Center West. Photo by Sonia Smith-Kang. I love driving. 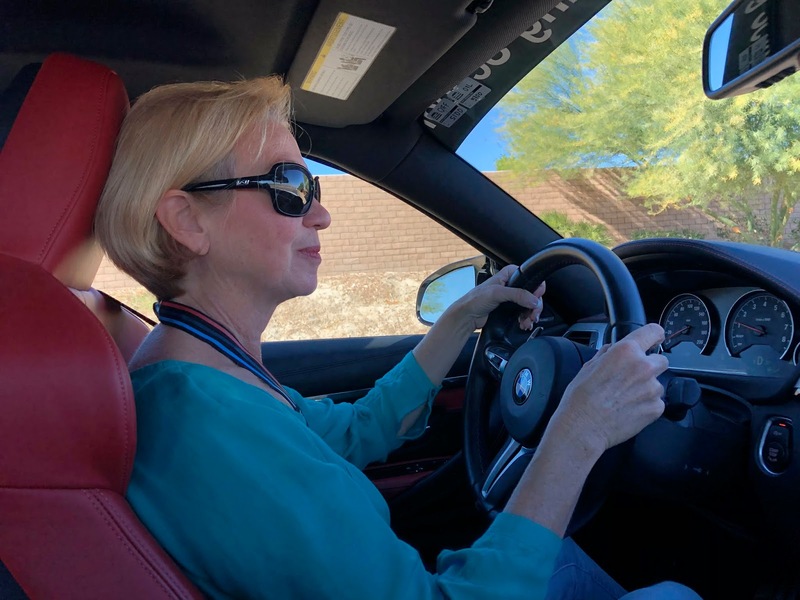 But I never realized just how much I love driving, and driving FAST, until I experienced the tracks at the BMW Performance Center West in Thermal. I can’t recommend this experience enough for anyone who feels a need… a need for speed! (I’m looking at you, Tom Cruise). I’ve always been fascinated by physics, so when the drive instructor casually mentioned “G-Force” at the start of the classroom lesson, I was full in. 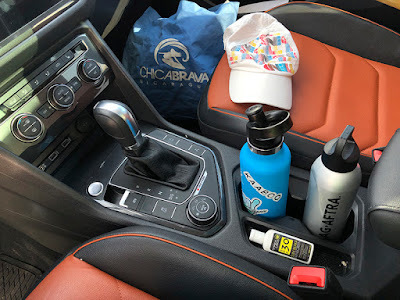 While fueling up on coffee, I learned so much about positioning, steering, accelerating and braking, in a way that I hadn’t been taught before. I was raring and ready to go. Now, I’ve never been a speed demon behind the wheel (granny alert), so I was certain I’d hold everyone up on the M track, I knew my limits. Ahem. Turns out I was way wrong about myself. I floored it every chance I could. I proudly clocked 132 mph as the instructor remote-radio’d “good job, see, nothing to it.” I pushed my limits, trusting the instructor and the car to have my back. They did, and I sped right on past my previous self. It felt good, it felt real good. The biggest trust issue I had was braking. But these performance cars are built to drive fast and stop on a dime. They did so without fail. Once I felt it for myself, I forgave all the tail-gating BMW drivers that annoy me so much on the freeways. I realized why they drive like they do. Because in a BMW…you CAN. Stop. On. A. Dime. So, going to the BMW Performance Center was a BIG thrill, and I don’t think I stopped smiling the rest of the day. 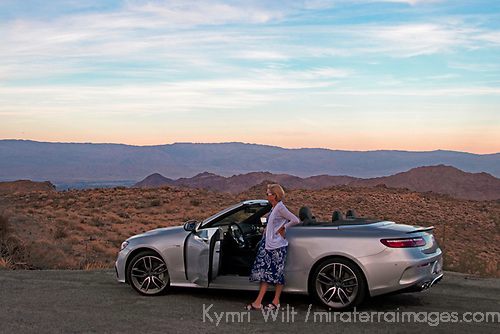 While there are plenty of resorts to choose from, I spent my last two Palm Springs getaways at the Miramonte Resort & Spa in Indian Wells. 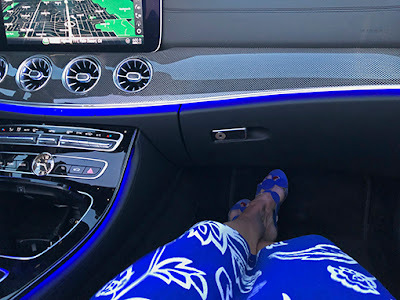 You can link to read about my first impression “A Palm Springs Resort for all the Senses” on A Girls Guide to Cars. 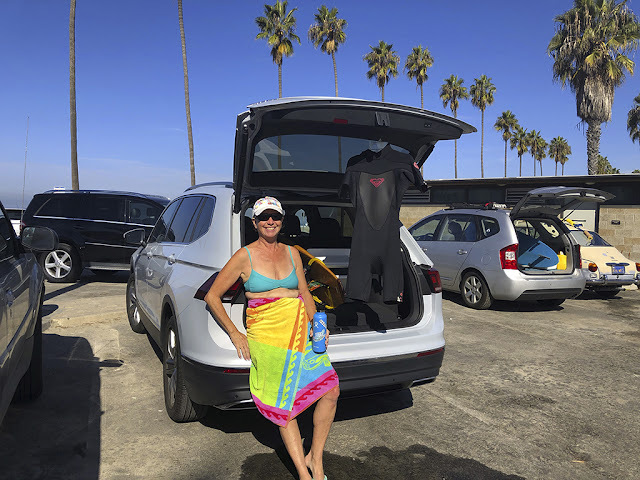 Continue reading here to learn what warranted a deeper dive at the Miramonte, namely, the pools and spa. After our #Drive2Learn Conference finished, I stayed on another night and day to unwind and decompress. I slept deeply and soundly. I dedicated the next morning to me, my health, and my well-being. I enjoyed a tasty and nourishing breakfast at Citrus & Palm. Then I turned off the phone, changed into my swimsuit, and disappeared from the grid in an effort to revitalize my mind, body and soul. Sometimes, you just have to take care of you, right? I was dehydrated, and (physically) felt like a strip of jerky. I headed to the main pool, and had it all to myself at that time of morning. I plunged in. Instantly, I was back in my element, and already feeling better. The sun warmed my skin as I air-dried on a chaise-lounge. Within moments, I was as close to my happy place as I can be away from the ocean. I thought I was good, then I ventured into the Well Spa (my time on my dime). Once through the doors of the Well Spa, I was given a tour of the facilities, then directed to the women’s changing room where a locker awaited with robe and slippers. I immediately regretted not having shown up first thing, there was much to experience. My highlight? Definitely the Eucalyptus-infused Steam Room. Trust me, it’s just the BEST THING EVER. Coming in at a distant second, the River Benches, where private nooks with waterfalls washed away the tension in my neck and shoulders. Back inside the Relaxation Lounge where I awaited my treatment, I almost got annoyed by three chatty women who wouldn’t shut up. Rather than let my irritation build, I realized they were on their own girlfriend’s getaway, and I asked the occasion… a birthday! Before I knew it they handed me a phone and I was staging a photo of them in robes with roses and champagne glasses and a sparkling tiara on the birthday girl! How FUN for them, and their happy spirit was contagious. I was honored to capture the occasion for them. Now, because I am nothing if not honest, I was somewhat disappointed with the massage treatment itself. She skimped on the "Rain" of oils which my skin so badly needed. Rather than let me relax and drift off, she made comments about my dry skin and suggested products I should use. The tactic of up-selling is common on cruiseships, but please, I’m trying to relax here! I have read great reviews, and I’ve talked to personal friends whose opinions I value about their experience at the Well Spa, so take mine with a grain of salt and try it for yourself. Even a day pass just to experience the Eucaplytus Steam is worth it! Feeding the mind body and soul is one thing, but feeding the appetite of an ever-hungry vegetarian like myself takes more effort. Let it be known that, regardless of dietary preferences, Greater Palm Springs does not disappoint! Veggie Tacos at Tommy Bahama's on El Paseo. Photo courtesy of Penny Giakos-Garduno. Tommy Bahamas: Sure, I already knew the beach-style clothing brand and chain, but here I discovered they also serve beach-style food to match. The dining staff are friendly and accommodating, and the food presentation was impressive. I opted for Veggie Tacos, and WOW, they did not disappoint! I was served a plate of 3 soft tacos, accompanied by plantains and a creamy coconut-yogurt dip. These were not your standard veggie tacos overloaded with greasy onions and peppers. Far from it. The veggies were fresh, flavorful, and healthy! Each bite treated me to a different one: Roasted carrots, cauliflower, marinated mushrooms, tomatoes, roasted corn salsa throughout, and the most delightful Wasabi-Avocado Creme to tie it all together. Chipotle Aioli and fresh cilantro added to the flavor; slaw and crispy tortilla strips added to the texture. 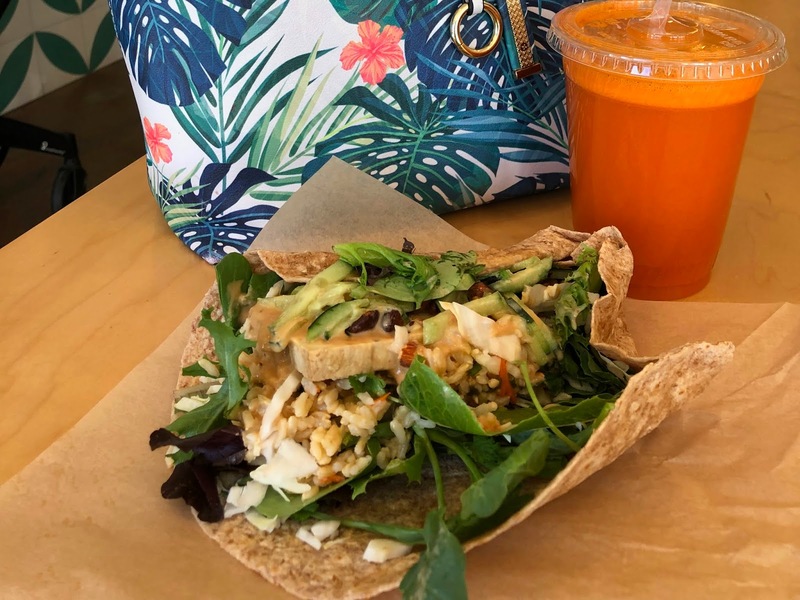 When it comes to the ultimate in Veggie Tacos, Tommy Bahamas nailed it. As for dessert, options are dazzling, but best to go simple, Key Lime Pie. Thai Smile (My choice on my dime): I will never pass up an opportunity for Thai food, especially when I spot a one-off (not a chain). Thai Smile of Rancho Mirage, re-located to El Paseo, was everything I expect from a quality Thai restaurant, with fresh ingredients and flavors galore. I had a $12.95 lunch special of Panang Curry (with tofu), served with choice of soup or salad (or both for $1.50). Their Thai Iced Tea hit the spot. Lucious Lorraine's: Can I just tell you something? Coming from an organic-leaning vegetarian of over 25 years, it really doesn't get much better than this. I took one look at the chalkboard menus on the walls and had to pinch myself - I couldn't believe that an unpretentious place like this really exists, and the prices were actually reasonable! A far cry from anyplace boasting organic in my home town of Cardiff/Encinitas. Lucious Lorraine's Organic Juice & Eatery menu is extensive, but I settled on the Asian Tofu Wrap ($7) and splurged on a fresh juice blend, the Ginger Hopper ($8.50 - sounds expensive but that's completely in line with going prices on raw organic juices). I'm so glad I took a photo first because once I took a bite....I could do little else but savor every texture and flavor with a resounding "ahhhh" or "yummmm". I especially loved the roasted almonds and peanut sauce. The Ginger Hopper perfectly complimented the wrap, which I couldn't even finish in one sitting! Finally, I grabbed a snack to go (we were heading out on a road trip, after all) from the counter. I chose a "Molly Bar" and, at just the right time, while my partner was busy driving, I took a bite and decided right then and there, this is TOO GOOD TO SHARE. Seriously, don't even think about splitting one even with your bestiest bestie. Your Turn! 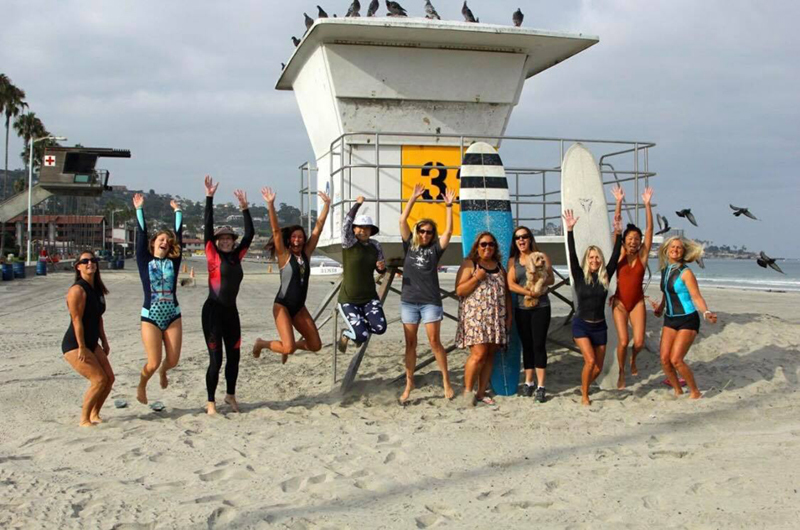 Enter to Win Your Own Race & Relax Getaway!